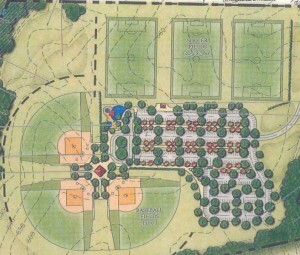 The York County Council on Monday approved a preliminary step to bring an athletic complex to the Lake Wylie area, according to a Rock Hill Herald report. The council OK’d plans to set up a special tax district to help pay for the nearly $7 million complex that would be adjacent to Crowders Creek Elementary School. The 50 acres adjacent to the school is owned by York County, however, the council members were split on who would ultimately run the complex, as the country does not want the responsibility. Lake Wylie Sports Commission is the group behind the drive for the complex, but the commission does not want to run the complex. It is possible the special tax district, once established, would be the entity responsible for the complex, according to the report. The hope is the complex, with 3 multipurpose and 3 baseball/softball diamonds, would drive more tourism by bringing sports tournaments to the Lake Wylie area. The hope is that local restaurants and lodging would also benefit from the proposed complex. Signatures and fund-raising are the next step in bringing the facility to fruition. In December, York City Council approved $2.45 million from its hospitality fund toward construction costs. Ballots are to be circulated in 11 districts, and 2,751 signatures are needed in order for the sports complex special tax district proposal to be added to the November ballot. Neighborhoods closest to the proposed complex are Autumn Cove at Lake Wylie and Tullamore, which is still being built out. For the full story, see The Rock Hill Herald. See our listing in Autumn Cove, a beautiful 3-bedroom, 2 bath home with numerous upgrades! Filed Under: Lake Wylie News and Events Tagged With: Lake Wylie Communities, Upcoming Lake Wylie area Attractions and Entertainment.